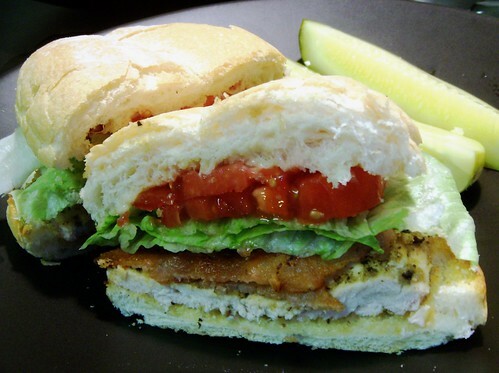 classic chicken club sandwich, originally uploaded by aarn! +10th October, 2008+. tenderized some chicken, tossed it in canola oil, thyme, crushed garlic, salt, and pepper, then dusted it with corn meal and put on a baking sheet at 425-degrees for 7-minutes on each side. placed the cooked chicken on a toasted bulky roll, with a smear of homemade mayo, a couple of pieces of thick-cut bacon, some iceberg lettuce and a few slices of an ugly tomato. served with spears of a nice big pickle.